Meet-up at the Jus Bar (4908 Rainier Ave S), 6-7 pm on Wednesday May 23 to learn more about this initiative. 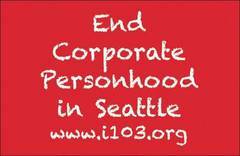 I-103 seeks to ban corporate spending in elections, restrict corporate lobbying to public forums and establish a community bill of rights including rights for workers and rights for nature. 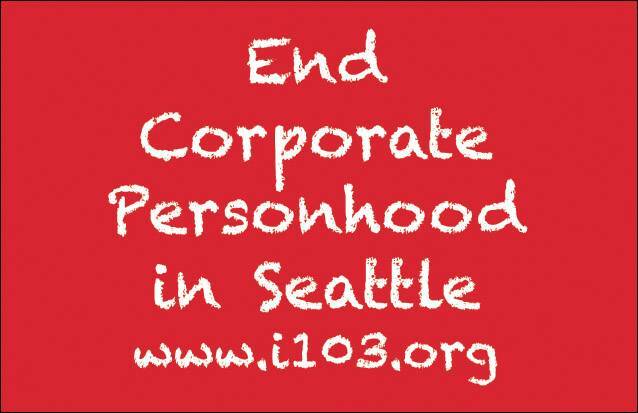 We're currently gathering signatures to place Initiative 103 on the November ballot. This meetup is a great introductory meeting for new people to learn about I103, ask questions and get involved in volunteering. You can RSVP or just stop by after the Farmers Market. I've got a petition for I-103, and would be happy to bring it by if you haven't signed it yet and would like to. You can also print out your own from www.i103.org, or look for someone at the Farmer's Market most weeks. The initiative is broad and has some flaws, in my opinion, but the overall message is very good. Let me know if you want to sign it. Hate to be a negative Nellie but this initiative is dead on arrival. It's a hodgepodge of vague and unenforceable pie in the sky notions. A better tactic would be to break I-103 up into a bunch of different initiatives and let them live or die on their own merits. Happy to be positive Nellie but I signed this petition the other day. Corporations are NOT people. What inspired me to sign? The most powerful institution on the planet that the media ensures you never heard of — the Bank of International Settlements (BIS) — is a privately owned corporation that regularly violates human rights and is above the law, as no government is powerful enough to touch this institution. Note how you never heard of the BIS before — clues you into the level of information control going on. Many of the same people who are involved with the BIS also hire the Tavistock Institute of Human Relations (based in London, UK), which is regularly contracted by governments for the purpose of coordinating social engineering across the mainstream media, which is also privately owned. Tavistock uses the predictability of human nature to keep people ignorant and in the dark about how our "free" republic is mostly a tightly-controlled illusion, designed specifically for "farming" humans, which keeps world economies running and central bankers (the BIS) on top of the pile of humanity. Corporations like collectivism, and use the Tavistock Institute to push this agenda, since that helps destroy the identity and needs of the individual. This is reflected in our local community with such movements as "sustainable development." Good on you and the petition! Just heard on the Thom Hartmann show.You were terrific!I will sign your (work of genius) petition immediately!The 'corporations are people' baloney has gone on long enough.The very first time I heard it,-It is the dumbest most manipulative idea that any human could think of.